Travelers who have visited our dojo from overseas recently have remarked that there is no one else is doing karate the way we do at our dojo. The way we move is of interest to people from all over, so they do come to visit. We can easily show them what we do, and we can explain the rationale for it too. Our discoveries are no secret – neither the result nor the means we have used to achieve them are concealed. The approach we have used is open to everyone who is seriously practicing martial arts. However there are some cultural rigidities in the way martial arts is often practiced that inhibit the progress of the students and produce spiritual and technical rigidity. The presumption that there is a fixed curriculum of technique which is known completely by the advanced teachers and which has been transmitted to them as a complete, fully formed system from past teachers, and which is now in the process of being presented to a new generation of practitioners, is a fiction. It is a useful fiction in that it does give coherence to the way material is introduced to students in their first few years of practice. It gives them faith that the curriculum they are learning is something genuine, with value, as judged by people with the knowledge and experience to judge these things. Beginners, after all, cannot judge the quality of a martial arts curriculum. They may have biases and prejudices. They may have read a book or seen some TV shows about it and as a result have some opinions about what they are seeing in their local dojo. That is why mixed martial arts, or kickboxing, or tae bo, (or Okinanwan karate before that) all had popular booms in their day. But presumptions aside, no beginner can adequately judge the quality of a martial arts curriculum. So they rely on claims of legitimacy based on lineage and on the confidence of the teacher they are seeing first hand. That’s about all they have to work with in making a decision as to what art to pursue. Because they start that way, and then invest their time and energy in that art, they become ardent partisans of that school, that master, that lineage. After all, if that master is great, they are smart to follow him, if he isn’t, it casts doubt on their own achievements. As a result some martial arts people become fanatical advocates of their style and lose the ability to judge it honestly, on a practical level. If all their information comes from within that school’s small stream of knowledge, they never get a broader view by means of which they can evaluate it. This is the opposite of the scientific method of information sharing. Scientists are trained under masters (their professors) and (as part of the process of getting a PhD) they are asked to master an existing body of knowledge. But there the parallels with martial arts education cease. In science there are peer-reviewed journals. Scientists doing research in their area of expertise submit their discoveries in the form of papers to a panel of experts in their field. The experts vet the material. If it is legitimate they approve it for publication, so all the scientists who might make use of it have access to it. Cranks and dilettantes are kept out of the journals and the advance of scientific knowledge progresses. Certainly there are disputes and egos and opposing parties. But as a whole the system works because there is a fluid access to information, and although individuals are credited with their discoveries, and their rights to their ideas may be protected with patents, the spirit of the scientific community is collaborative. Knowledge is tested and it is shared. The democratization of access and the sharing of ideas are being felt in every sector of our culture now, due in large part to the internet. Ask your local music industry magnate or movie mogul about the democratization of access – for creative people to reach an audience, and for an audience to freely sample a range of creative experience they would never had access to before, when artificial barriers more severely restricted access. Martial arts is somewhat retarded in its cultural development. This is not a necessary function of martial arts. In fact there is a lively martial arts culture that has departed from this historical rigidity. We have to be both cautious and bold as we proceed in creating a truly useful contemporary martial art. Because in moving away from the inwardness and self-promotion of the style-centric version of martial arts, we have to make sure that we are not throwing away the structure and coherence that allow new martial artists a chance to develop a firm foundation in the mind, movement and values of a truly cultivated martial artist. Those abilities are encapsulated in styles and have to be retained if we are to move forward. 1.Learned fundamentals in a genuine style. Master the katas, even if you only understand them superficially, repeat them thousands and thousands of times. Sometimes people think this only reinforces bad habits. If you just repeat kata as a robot then it would. So don’t repeat as a robot. Allow the kata to teach you. As you move your body will find ways to become more efficient, faster, more effective. 2.Get advanced information from a wide variety of sources – in striking and kicking, body shifting and mechanics, energy transfer, vulnerable points, seizing and grappling, in groundfighting, in tactical thinking, in developing an intense will to win, in conditioning the body and mind to develop toughness, resilience and intelligence. 3.Apply those lessons to every move of your kata. Use the kata as a template for discovery and work every move in as many ways as you can think of. Allow your broad knowledge to illuminate your kata and use the kata to bring your knowledge and ability into a coherent, usable system of practice. 4.Partner practice. Get your hands on your training partners and challenge each other. Test everything. See what works. What fails. Find out why. Don’t dismiss what is difficult just because it is difficult. Set it aside if you can’t use it, but check it again and again until it’s secrets open up. They will. I remember very well when I first started people giving nonsensical interpretations of moves, saying that some katas have no interpretations, saying that stances like kosa dachi or nekkoashi dachi were useless in practical application, or teaching naihanchi in a way that was totally useless for practical application. All of those assertions I once heard presented with great confidence have now been proven false. Those very same stances and katas are now experienced by all of us here at our dojo, and elsewhere, as powerful tools for defense. But it takes a willingness to persist, to accept not-knowing for a while, to make your discoveries, and to build the mountain stone by stone. 5.Street experience. The reciprocation between police experience on the one hand, including the knowledge collected and refined in various defensive tactics systems, and street experience both technical and tactical – and dojo experience on the other, is indispensable. You cannot do genuine modern martial arts practice without the objective test of street experience. And you cannot get really good at your skills without daily dojo practice. All the students in a dojo can benefit from the practical experience of a few cops in the group. But any dojo that lacks this dimension runs the risk of becoming self-referential – of relying on imagination rather than real experience. I once heard a person say in all sincerity and with real confidence “At my level I feel comfortable handling three unarmed or two armed attackers.” No one with street experience would ever presume such a thing. That attitude is a result of training only in the hot-house environment of the dojo and never working on the street. This gross misunderstanding is a danger to anyone influenced by it. The opposite error also arises: there are people who do work on the street who think they have seen it all and somehow believe that under pressure they will spontaneously perform like a natural born Bruce Lee. They won’t. Without consistent training the most talented athlete or the baddest whatever will perform under pressure at a level far below what they could do with training. That may be enough sometimes. But sometimes it won’t. 6.Synthesize all that and continue to question and explore, even as you remain consistent in the practice of the katas you learned, however superficially, years ago. 7.Train hard. Most people who consider themselves modern martial artists train two or three hours a week. That is good enough to get a workout, and to get some decent skills. If that is all the time you have, enjoy it. But if you want to be a professional, if you want to achieve your potential, if you want to change your body and mind profoundly and attain a level that most people will never even conceive of, then you will need to practice a few hours a day. No musician, no surgeon, no pilot would call themselves a professional if they practiced two hours a week, and then took a few weeks off a few times a year. Never. People feel discouraged to hear how much work it takes. And they will never get a rock star’s or surgeon’s or pilot’s salary in compensation for it. The rewards, as I have seen, are far greater. But you have to make the investment. There is no alternative. Practice diligently for a few hours every day. Keep your mind receptive to fresh knowledge and perspectives. Dedicate time every day to deepening your art. Give it a decade or two. You’ll be the real thing. You won’t have to invent a story about some old master from somewhere else to give credibility to what you do. You will be that master. You will be the example of a genuine practitioner, in a world that needs to understand the value of a cultivated life. Jeffrey Brooks, Seventh Degree Black Belt, US Shorin Ryu Karate, has been the director of Northampton Karate Dojo in Northampton, Massachusetts since 1987 and director of Northampton Zendo since 1993. 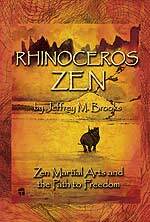 He is a police officer and police instructor, and the author of “Rhinoceros Zen – Zen Martial Arts and the Path to Freedom.” His column Zen Mirror and other articles appear on FightingArts.com.